Welcome to BirdPhotos.com, a totally free educational site featuring high resolution, high quality photos of over (new) 5500 species, with hundreds more in User Albums. The main gallery includes scientific information through integration with several databases including the 2018.2 IUCN Red List and IOC 9.1 (new) taxonomy. BirdPhotos.com is also a place for photographers, nature lovers, and 'birders' to exchange ideas and information; we now have blogs, personal photo galleries, news, Bird Listing Software, checklists, Range Maps, histograms, the popular Bird Identification Quiz (with new Multiple Choice option), Geolocation maps, subspecies integration, non-English bird names, reverse video toggle, social networking, photo sharing and a discussion forum! The main gallery is mostly birds, but other images can be featured in User Albums or special promotions. Gallery photo are selected based on scientific, artistic, or technical merit; ideally photos would excel in all three areas. And the quality of the main gallery is always improving as weaker photos are updated. Photographs on this site have many different copyright and usage restrictions. Some have been placed in the public domain, while other photographers have strict usage requirements. Each image contains specific information. For professional photographers who want to sell their photos, a watermark could be placed on the photo, and the copyright information set to "Copyrighted, contact me for pricing". We are currently offering free advertisement to professional photographers who contribute to the site. BirdPhotos.com is always looking for partners or contributors! If you are a writer, we will gladly promote your article and information. If you are a photographer, we would love to feature your photographs and information here (more info), even on the home page, and also link to your site. 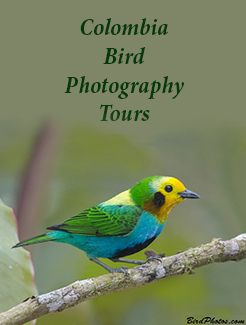 BirdPhotos.com is currently serving millions of pages to tens of thousands of visitors yearly. I also hope you will participate in the blogs and discussion forums.